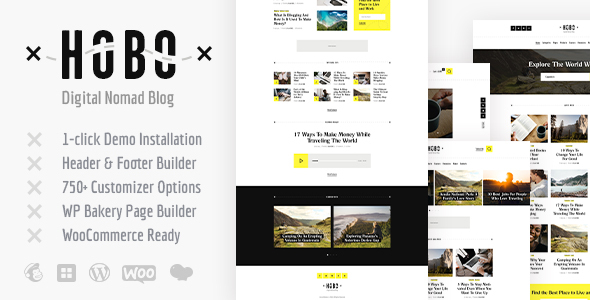 Hobo is a modern, attractive & responsive Digital Nomad Lifestyle Blog WordPress Theme. If you are a traveller, writer or a blogger and write travel articles, stories, lifestyle news, have a travel blog or entertainment blog – share your article or life style story with Hobo! It also works for a viral blog, personal travel blog. It fits entertainment blog projects, professional magazine, niche blogs etc. Hobo offers a lot of handy functions. For example, it supports a number of diverse blog layouts and has extra fast page load. Hobo has plenty of premade homepages, modules, shortcodes that can be used in your future project.